Aluminum Foil Containers are used in every restaurant in the country for serving takeout or packaging leftovers. 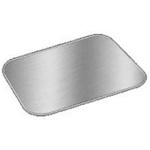 Aluminum utility cups come in handy for certain applications and steam table pans are used in many restaurants. Aluminum containers are stackable, sturdy, and resist leaking. Cleanup is easy and once cleaned, containers can be reused. Foods also stay fresher than in Styrofoam or plastic containers. Handi Foil Round Pan With Lids - 7 in. Handi Foil Round Container With Lid Combo Pak - 9 in. Handi Foil Round Pan With Lids - 9 in. Handi Foil Round Container With Dome Lid Combo Pak - 9 in. 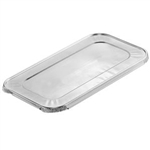 Handi Foil Oblong Shallow Container - 1.5 Lb. Handi Foil Round Container With Lid - 7 in. 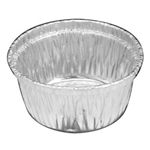 Handi Foil Round Container - 7 in. Handi Foil Aluminum Round Container - 7 in. Handi Foil Round Container - 8 in. Handi Foil Round Container - 9 in. Handi Foil Round Container With Lid - 9 in. Handi Foil Oblong Food Containers 1.5 Lb. Handi Foil Oblong Container - 1 Lb. Handi Foil Oblong Container - 4 Lb. Handi Foil Economy Round Container - 9 in. Handi Foil Round Container Cup - 4 Oz. Aluminum Foil Containers from your restaurant supply superstore are great for food takeout. Just remember not to put aluminum pans in the microwave. If you do, you'll get an incredible light show and probably end up ruining your microwave.